This just could be the finest image I have taken or in fact will take this year. Just about everything came together in this one shot to show off this rather shabby run down old house, that was so intensely disliked and reluctantly photographed by a very lovely French girl, Cecile on a previous Transient Light course. One of the shots I took of this house ended up being part of my winning portfolio in the Scottish Landscape Photographer of The Year, but in all honesty this surpasses that one by a good margin. For the briefest moment transient light was spawned as the sunrise found a tiny gap in the clouds and I watched blood red light race past the slope beyond the house until for the briefest moment it bisected it. 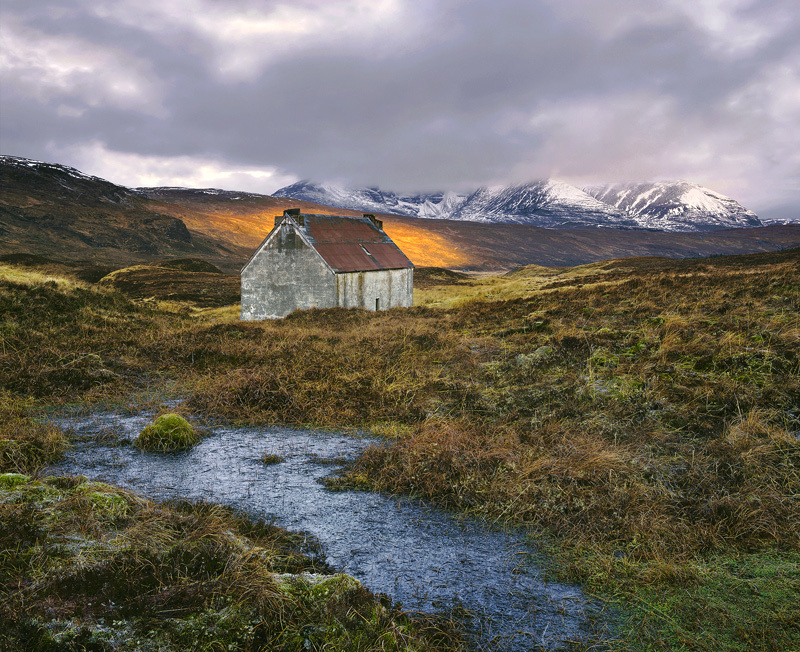 A closer look reveals the tiny shape of a further ruined bothy beneath the pinkened peaks of An Teallach and even the trace of a rainbow. It's a while since I felt the electric thrill of the hairs on the back of my neck stand to attention at the sheer excitement of what I and the rest of my group witnessed.